Nokia has just announced the new Nokia C5-03 touchscreen phone fitted with a resistive touchscreen panel rather than the capacitive screens of the more expensive Nokia N8 and C7 smartphones. 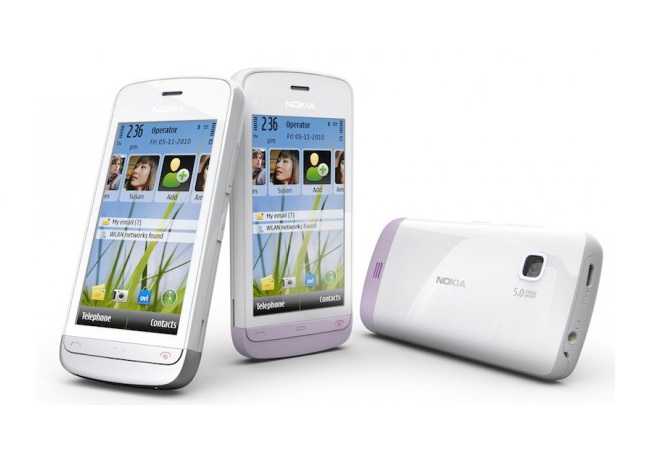 The Nokia C5-03 has a 3.2-inch 640 x 360 and runs Symbian^1 and is equipped with a 5 mega pixel camera. Its also capable of quadband GSM/EDGE and triband WCDMA (900/1900/2100), with Wi-Fi, Bluetooth 2.0+EDR, A-GPS and a microUSB port, an FM radio (but no FM transmitter) and a microSD able to accept cards upto 16GB. Expect to get around 11 hours of use from a single charge and around 25 days of standby. The Nokia C5-03 will be available towards the end of the year for around $237 or €170.